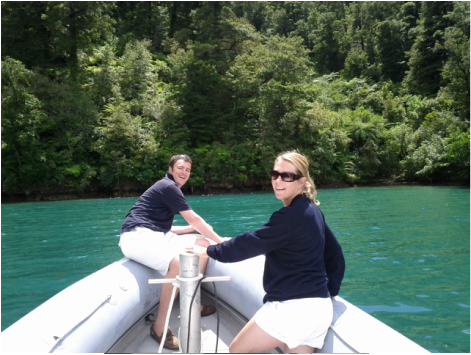 Havelock Water Taxi transport to and from your accommodation in the Marlborough Sounds. Your friendly water taxi and boat service. FOR ALL YOUR WATER TRANSPORT NEEDS AROUND THE BEAUTIFUL PELORUS AND MARLBOROUGH SOUNDS. Havelock and Sounds Water Taxis operates from Havelock, known to many as The Gateway to the Sounds. Our 40ft Interceptor provides a safe, reliable comfortable service throughout the beautiful Sounds. We specialise in Tiki Tours, Hike, bike and kayak drop offs and pickups, transport available for holidaymakers, tradesmen, school trips with onboard amenities and Payclip. Pets are welcome, Contact Brownie and the friendly team for all your water transport needs. Looking for Water Transport to or from your accommodation in the Marlborough Sounds ? Water is the best form of transport for around the Pelorus/Marlborough Sounds, even with road access to some areas doing hiking, biking or kayaking pick-ups and drop-off's by boat is still the best option. Let us deliver you quickly and comfortably to any of the local Resorts you might be staying at. On the Track Lodge, Raetihi, Hopewell Lodge, Te Mahia, Portage, Te Rawa, Pohuenui Station, Waitata Bay Lodge, Forsythe Island. During your stay, take time out, book one of our Tiki Tours, and let us show you around, there is plenty to see, be it the Green lipped Mussel Farms or Salmon Farms? 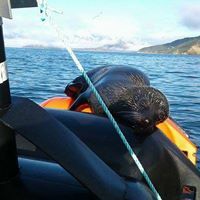 Maybe its the marine mammal's and wildlife you desire to experience? we have it all here in the gorgeous Pelorus Sounds. Our Skipper has over 28 years experience, there are plenty of life jackets on board to fit everyone and room to handle up to 15 people at a time with gear, 24 hours a day, 7 days a week all year around. You will find us under the Marina Customer Service Centre and feel free to email us if you have questions. Now that you have found us we look forward to hearing from you and seeing you on the water soon !